Paul Pogba has given Manchester United the lead against West Ham from the spot, the Red Devils opened the scoring just minutes after West Ham had a goal disallowed. 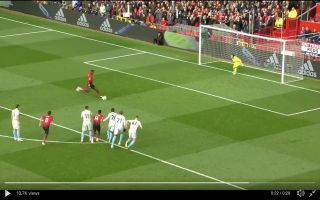 The Red Devils were awarded a penalty in the 17th minute of the clash, after some superb work from Anthony Martial, Juan Mata was clattered by Robert Snodgrass before he could get off a shot on goal. The referee had no choice but to point the spot. Paul Pogba stepped up and it looks like the Frenchman isn’t toying with his signature, stutter step run up anymore as he comfortably smashed the ball down the middle of the goal. A win for the Red Devils tonight will give them a massive boost ahead of the second-leg of their Champions League Quarter-Final against Barcelona on Tuesday evening.